This item is not available for purchase online. Please call us at 800.606.6969, or visit our NY Superstoreedysqtrrcvefabqvwfqyrvfttqtqra. 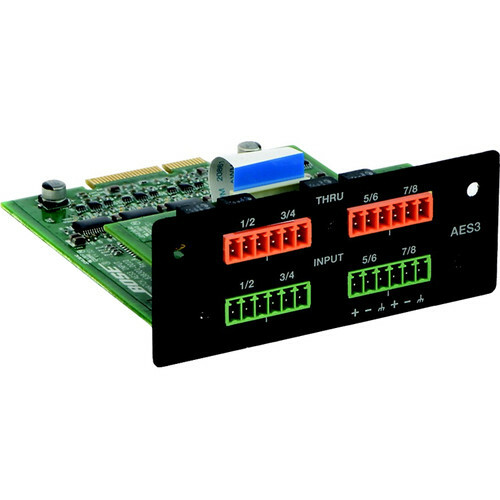 The AES3 8-channel input card allows PowerMatch configurable professional power amplifiers to receive up to 8 channels from AES3 sources such as mixing consoles and DSPs. The AES3 input card inserts into the digital expansion slot on a PowerMatch amplifier. A buffered passthrough connection on card allows digital audio to be daisy-chained to multiple PowerMatch amplifiers or other AES3 devices.